I’m having an email correspondence with a genealogist in Ireland. I’m looking to hire her to find records on my Holmes ancestors before they came to Canada. It’s been a slow conversation, with a number of delays, but I’m hoping that something will come of it. But today we were talking about a particular part of the tree, and while looking at my records for that part of the tree, I realized that I’d failed to transcribe some data. Here’s the story. I’ve mentioned before that the first of my family to come to Canada are Andrew and Susan (Susannah) Holmes, who emigrated here in 1845. I’ve also mentioned that Andrew died in quarantine at Grosse Île, Quebec. But they brought with them six of their seven children, who spread out and several of those kids end up in Lambton County, where I grew up. 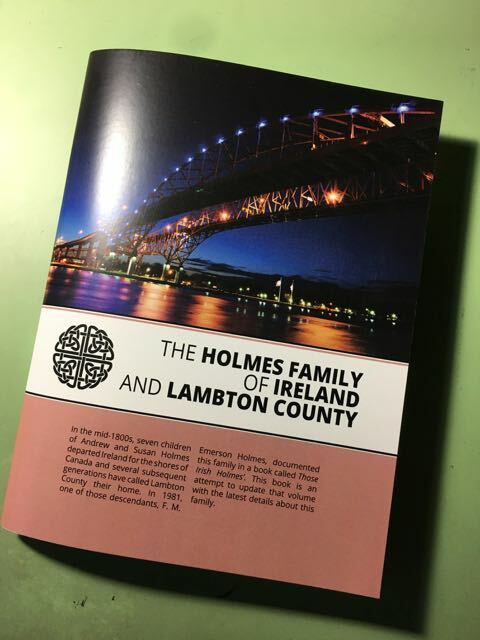 Mary Ann went to Lambton County and moved in with her brother, John Holmes and his wife, Mary Wilkinson. John and Mary only had one kid, but Mary Ann brought five with her. The youngest of those five might have been born in Canada, if the censuses are to be believed. If so, either Mary Ann was pregnant on the ride over, or James Dowler wasn’t the kid’s father. Or the censuses are wrong. This line of the family doesn’t have it easy. Mary Ann’s daughter, Ann Dowler, died in the London Insane Asylum. Her older brother, Thomas, might have also spent some time there. I’ve written, before, about the booklet I had as a teenager: Those Irish Holmes’ , by F. M. Emerson Holmes. 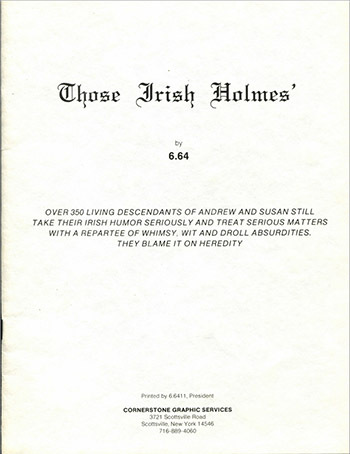 The booklet was a family tree of all the descendants of Andrew and Susan (Susannah) Holmes, who came to Canada from Cavan County, Ireland, in 1845. A few weeks ago, I got hit with a bit of a genealogy bug after letting it sit for a while and I started finishing up my revision to that booklet. Basically, I’ve tracked down almost all of the original names in the book and updated them with the latest information. Unsurprisingly, in the 35 years since the book was first published a large number of the people documented have since died, including F. M. Emerson himself. Newer generations are harder to find the details about. Sites like Ancestry don’t share details on anyone marked as still living although you can occasionally find a name in the most recent census (the Canadian 1921 census is the most recent census that’s publicly-available). As an aside: I feel like there’s been an up-tick in quality on how people have been using Ancestry. Just a few years ago, it felt like a bit of a slog to pick and choose the good quality records from other people’s trees; recently, I’ve been pleasantly surprised by how much good-quality information people have been adding. One area that’s really been helpful is in regards to photos. When I started adding photos to my family tree a few years ago, it seemed at the time like photos were rare. Now I’m fascinated by the number of distant family members I find with really good-quality photos attached to them. Also in the last few days, I’ve learned a few more details about a bit of a family mystery. It’s like a blast from the past, man. I have a copy in my hot little… Documents folder.